Order A. Vogel (Bioforce) Bambu ® Grain Coffee 200g from the Online Health Food Store UK. Buy A. Vogel Bambu ® Fruit & Grain Instant Coffee 200g and other quality Coffee Substitutes safely online in the UK. Coffee substitute: tasty, instant and caffeine free alternative to coffee. Our UK Health Shop sells real A. Vogel (Bioforce) and other Coffee Substitutes from top-quality brands safely online to customers throughout the United Kingdom in England, Wales, Scotland and Northern-Ireland. Where to buy A. Vogel (Bioforce) Bambu ® Grain Coffee 200g safely online? Shop at the Online Health Food Store if you are wondering where you can buy A. Vogel Bambu ® Fruit & Grain Instant Coffee 200g safely online in the United Kingdom. Our Health Shop is located in the UK and our award-winning independent has been serving customers in England, Wales, Scotland and Northern-Ireland since 1976. You can buy our Coffee Substitutes online and we post out orders to any UK address. 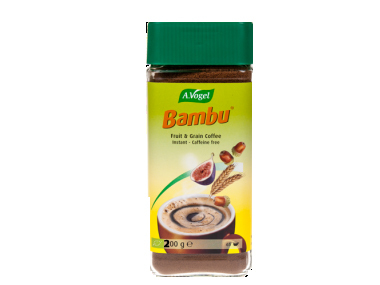 Bambu ® Grain Coffee 200g - A. Vogel Bambu ® Fruit & Grain Instant Coffee 200g in Coffee Substitutes and Drinks.